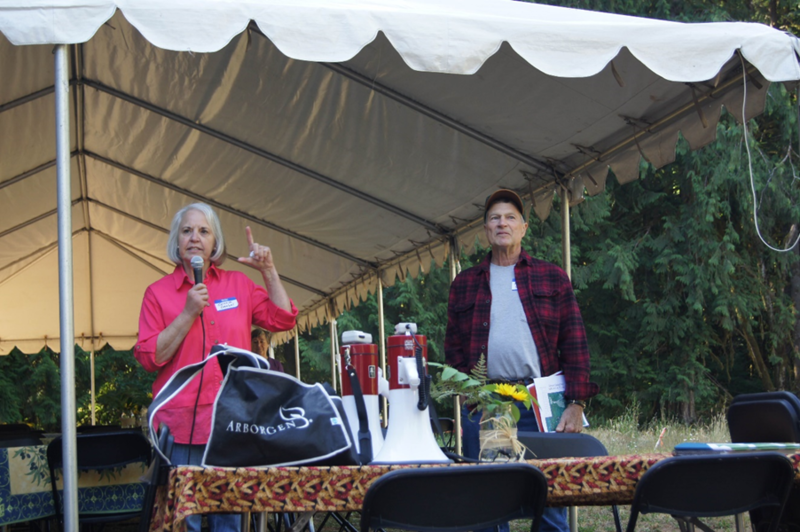 On July 21st, 115 participants arrived at the Gaebel Tree Farm in North Plains for a Neighbor to Neighbor Woods Tour. 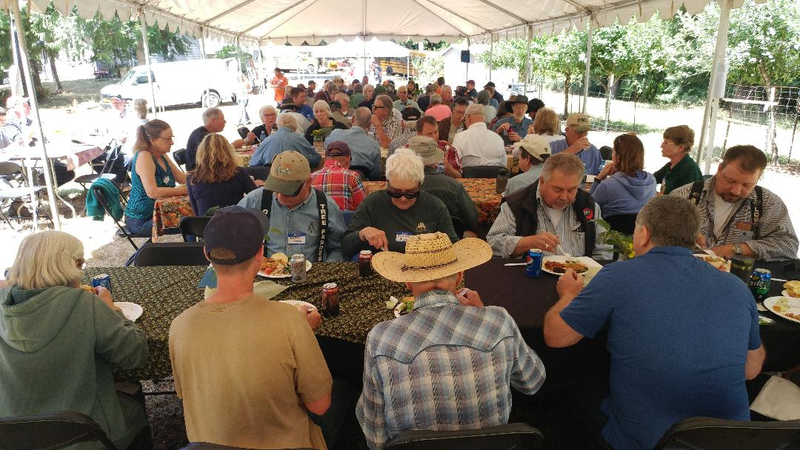 In 2017, the Gaebel’s were the Washington County Tree Farmers of the Year. 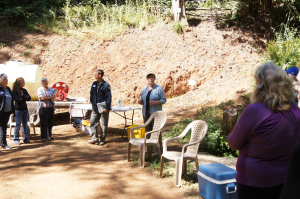 The tour was sponsored by the Gaebels and the Washington County Small Woodlands Chapter. 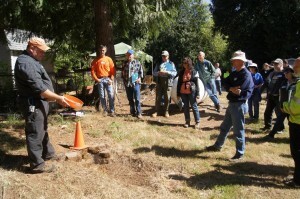 It was funded by a grant to OSWA from Oregon Forest Resource Institute. 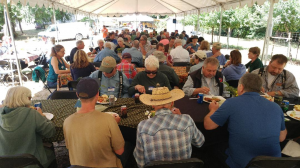 The topics covered at the tour included, an overview of pond maintenance, food plots, portable sawmilling by family friend Clint Michael; the topic of commercial thinning was covered by Steve Cafferata; road design and culvert installation was covered by local ODF stewardship forester Nate Agalzoff and Tualatin Watershed Council representative, April Olbrich; and Big Horn Logging’s, Mark Stanley covered the active logging on the property. Connie and Rich Gaebel discusses the family and property history. In 1979, Rich and Connie Gaebel purchased this property as a rural place to live, a get-a-way and a place to hunt. It is the southern 40 acres of an original 160-acre parcel. Access required building a 60-foot clear span bridge. The 160 acres had been logged at the turn of the century and again in the 1950’s but never replanted. It was mostly brush, hardwoods and scattered young conifers. 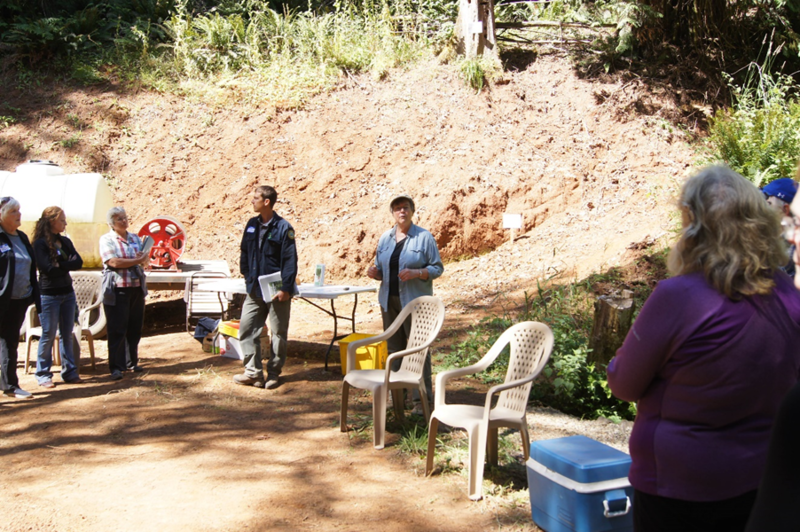 It was also used as a horse trail riding area with access to the coast range. Old logging skid trails abound and evidence of an old rail road grade running parallel to the creek was also evident. There is an old saw mill location close to the old rail road grade. By 1981, Rich with help from friends and family built a road, bridge, cleared and planted 3 acres. By 1985 they had cleared and planted an additional 14 acres. Rich and Connie tried raising cattle and Christmas trees. In 1994 they converted the Christmas trees to forestry. Rich installed culverts where the road crossed three small creeks. One was recently replaced with a 36” fish passage culvert. In the late 90’s, they installed a wildlife pond with water right’s and wildlife food plots primarily for deer, elk occasionally visit the site. In 2003, he logged and cleared three small areas, totaling 1.6 acres, and planted Cedar trees in groves. They were thinning in 2016 and are now thriving. 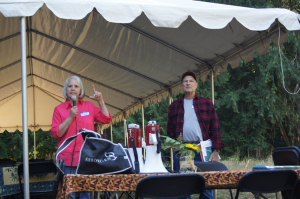 Rich and Connie became very active in the Washington County Small Woodlands chapter in 1980.